"Life is a joke, so why not die laughing?" is the moral of The Clean House, as well as the rallying cry of the newlywed cancer-stricken Ana—whose recently-acquired family encompasses her doctor/husband, his ex-wife, his former sister-in-law, and their housekeeper. Her rejection of the depression associated with lingering disease is symbolized by her pet fish ("a fighting fish" she declares defiantly) whose bowl is granted pride of place, downstage of the couch upon which the invalid is bedded. With audience seated barely four feet away in the smallest of the Athenaeum's studios, there is no mistaking the live Beta fish swimming at energetic pace under the high-wattage lights. Recent seasons have featured plays incorporating animals—sometimes billed as props, sometimes as performers—in their dramatic action. All theater facilities are not equipped for on-site fauna, however. A company that owns its playhouse, such as Lifeline, could board the albino rats appearing in The Woman in White. Chicago Shakespeare's spacious quarters easily accommodated a waiting pen for the dogs hired as extras in The Merry Wives of Windsor. Oh, and let's not forget La Bayadere, where the Joffrey Ballet's cast included live snakes, transported nightly by their trainer in a climate-controlled van. This Bluebird Arts production, however, occupies a rental space bereft of extensive storage space, its players arriving for each performance and departing immediately afterward. Furthermore, tropical fish are notoriously fragile, sensitive to the slightest disturbance in their environment. What special measures are implemented to ascertain that Brutus—as he is called by his real-life owner, stage manager Anna Lafontant—will complete the run? 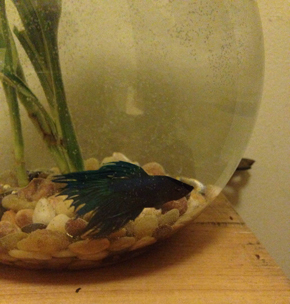 Brutus' schedule has him spending his off-days at home, but on show weekends, he lives in a room backstage at the Athenaeum (with a warming mechanism on his aquarium to ward off the chilly drafts characteristic of theaters since antiquity). "Betas are very hardy fish," reports Lafontant, "He's accustomed to temperatures around 70 degrees, and since our auditorium does not abut any exterior walls, there's very little fluctuation in his surrounding conditions." Have you encountered any problems working with Brutus? "He loves attention." Lafontant confides, "When there are lots of people around, he'll show off. Sometimes audience members are so charmed that they stay after the play just to watch him. We have to nudge them out the door." The Clean House runs at the Athenaeum through October 26.